A good information system contributes to the financial success of the farm business. The information system should provide the manager with production information as well as current measures of the financial position, financial progress, income performance, and debt repayment capacity. A financial information system contains four essential and interrelated components: the balance sheet, the cash flow statement, the income statement, and farm records. The balance sheet indicates the financial position of the farm business at a particular point in time. The balance sheet shows what is owned versus what is owed. The difference between what is owned and owed represents the owner’s claim to the assets of the business, or owner’s equity. A projected cash flow statement (AGEC-751) summarizes expected cash requirements (including credit needs and repayment capabilities) of the business for a future period of time. The income statement (AGEC-753) shows the profitability of the business for a particular period of time, usually a year, and is used to analyze the financial success of the business. Farm records provide information useful in completing the set of financial statements (AGEC-752). 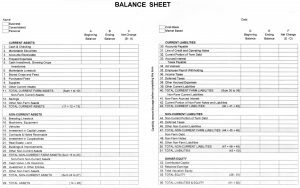 An accurately prepared balance sheet measures the financial position of a firm at a given point in time. It shows the value of assets that would remain if the business were liquidated and all financial obligations to others were paid. A series of balance sheets prepared at the same time of year for successive years shows the change in financial position and the progress being made by the business. This basic rule indicates that owner’s equity is the difference between the value of assets and the amount owed to creditors. Any changes in assets, liabilities, or owner equity are evident in successive balance sheets. Before completing a balance sheet, two important decisions must be made. The first is whether the statement will reflect the financial position of the business only or the consolidated finances of the owner and the business. The second decision relates to the method for valuing the assets. The supplement (statement form) provided with this OSU Fact Sheet is designed to be flexible with respect to these considerations. As the following sections explain, the supplement permits the user to select the combination that is right for his or her operation. Defining the entity: Because farms and ranches are characteristically personal or owner-operated businesses, personal assets and liabilities often cannot be easily separated from business assets and liabilities. In addition, a particular use of the balance sheet might dictate what information it should contain. For example, a lender may be interested in information on both farm and nonfarm assets. On the other hand, for measuring the growth of the farm or ranch business, it is meaningful to consider only farm or ranch assets and liabilities. Either approach is acceptable, but the method used should remain consistent from one year to the next. The supplement to this OSU Fact Sheet can be used for either approach. Simply check the appropriate box at the top of the page: Business, Consolidated, or Personal. Valuation methods: One of the difficulties in preparing a balance sheet is the valuation of assets. Market-basis valuation is an estimation method based on fair market value less selling costs. Cost-basis valuation adjusts the original cost for accumulated depreciation.2 Cost less depreciation is termed book value. Base value is a stipulated amount that roughly approximates cost and may be used when valuing raised breeding livestock (AGEC-323) to reduce the amount of record keeping necessary in accounting for all costs of raising each animal. Tax basis is cost less depreciation claimed for tax purposes. Market-basis valuation is an appropriate method for evaluating financial position for credit analysis and estimating owner equity. Cost-basis valuation is typically more useful when measuring the financial progress of an individual business from year to year. The Farm Financial Standards Council (FFSC) recommends that both cost and market values be disclosed for most assets (Table 1). A set of schedules to facilitate documentation of current and noncurrent asset values is available in OSU Extension Fact Sheet AGEC-791. These forms will aid in deriving the total value for each category of assets and in accounting for changes in total value due to new purchases and sales. Alternatively, the balance sheet may be completed by entering the amounts for each line without using supporting schedules. If market values are used, one must consider deferred taxes (a contingent tax liability) associated with selling assets such as machinery, equipment, and land at market values above tax basis as well as the transaction costs involved in selling these assets. The estimated tax liability is posted as deferred taxes in the balance sheet. A worksheet to assist in estimating deferred taxes is included with OSU Extension Fact Sheet AGEC-939. Table 1. Disclosure Recommended for Complete Financial Statements. 1 Additional information needed to do a complete set of financial statements including deferred taxes on the balance sheet and accrual adjustments on the income statement. 2 C=Cost, M=Market, NE=Net Equity, TB=Tax Basis, M/C= For most instances, market and cost will be about the same and either could be used. 3 GAAP requires lesser of cost or market, except for certain inventories ready for sale. 4 Purchased marketable livestock will need Tax Basis. 5 Less an allowance for doubtful accounts. 6 While full-cost accounting is desirable, for most livestock, base value is more practical. 7 Net Equity – if enough exists ownership exists to exert control in the entity. Flexibility of format. The supplement’s multi-column format provides considerable flexibility as to the desired method or methods of valuation used. The design of the supplement allows cost basis, market value, or a combination of farm asset valuation methods to be used. Columns have been titled Beginning Balance, Ending Balance, and Net Change. If only one method of valuation is to be used, Beginning Balance should represent the value at the start of the user’s tax or fiscal year, while the Ending Balance column is for the value at the end of that year. Net Change is the difference or change in value during the year. An alternate way to use the form is to compare cost or book value with market value for farm assets. 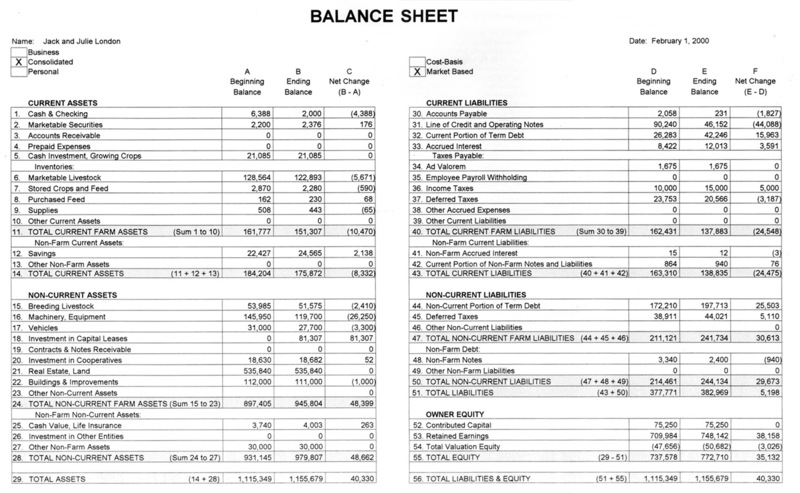 In this approach, the form would be used as a two-column or two-value balance sheet. The first column, Beginning Balance, could be retitled Cost-Basis (or Book Value) and the Ending Value column retitled Market Value. With this procedure, the Net Change column would represent the difference between book and market values. Cost basis or book values are necessary for estimating depreciation and for calculating income while market values are necessary to determine owner’s equity, collateral availability, and deferred tax liability. 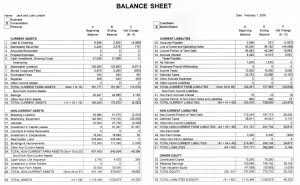 Following is a section-by-section explanation of the balance sheet. A fictional Oklahoma farm situation serves to illustrate parts of the statement. These instructions focus on developing a market-based balance sheet, notes on additional calculations needed for full disclosure, and complete financial statements are included in a separate section. Assets are usually defined as items of value owned by the business plus items owed to the business. The assets include production units held for sale (e.g. stocker calves, grain) or resources used in the business operation (e.g. breeding livestock, machinery, land). For financial analysis, the assets are usually categorized according to their liquidity or how readily they can be converted to cash. Current assets are cash and other assets that are typically and easily converted to cash in the course of business during the year without any loss in value. Cash and Checking, line 1 of the balance sheet, should include amounts held in all accounts applicable to the reporting entity. When preparing business-only statements, only the amount of cash held in business accounts would be entered. In sole proprietorships, cash for business and personal use is sometimes held in a single checking account (separate accounts are recommended, however). All cash that is available for use by the combined entity should be included on line 1. In the example, James and Dolly Madison are using the form as a consolidated statement. The Madisons had $3,421 in their checking account (line 1, col. A) when they prepared the balance sheet at the beginning of the year. Since the statements were prepared as a projection through the following year, they entered their end of year expected cash balance of $52,282 in line 1, col. B. Accounts Receivable, line 2, is a value for goods and services that have been provided but for which payment has not yet been received. If the receipt of payment for any of the accounts is doubtful, the amount is not included. The Madisons have accounts receivable of $900 on the balance sheet date. Prepaid Expenses, line 3, includes expenditures for goods or services that have not yet been received as of the balance sheet date or that cannot be readily classified as work in process. One example is cash rent that has been paid for a lease that will expire some time in the future. Another example is fertilizer that has been applied to the soil for a crop that has not yet been planted by the date of the balance sheet. If the crop were actually growing, this amount would be part of Cash Investment, Growing Crops (line 4). However, until a crop is planted, the cost of the applied fertilizer is a prepaid expense. The Madison example shows no prepaid expenses. Cash expenses for planting 499 acres of winter wheat, which were growing as of the balance sheet date, are shown on line 4, $57,385 (an average cost of $115.00 per acre). A comparable investment in growing crops is expected at the same point in time next year; hence, no change is expected in the cash investment in growing crops at year end. The preferred method for valuing farm inventories, lines 5 through 8, is the lower of cost or market since this method results in the more conservative value.3 FFSC recommended methods of inventory valuation are given in the next four paragraphs. Marketable Livestock, line 5, should be valued at market prices when preparing a market-based balance sheet. Market prices may be available from local newspapers and weights may be measured or estimated. Market value may be equal to cost for livestock purchased near the balance sheet date, but weight gain and price change may result in a market value that is significantly different from cost if the livestock have been held for some time. Cost of raised market livestock is more difficult to determine than market value (see OSU Extension Fact Sheet AGEC-323, Valuation of Raised Breeding Livestock). The Madison example includes raised and purchased cattle, steers, and heifers, grouped by weight with a total market value of $134,348. Stored Crops and Feed, line 6, are valued at current market prices if they are readily available. An estimate of the cost of production may be substituted for market price of a stored crop or feed if no market exists from which to determine price or when preparing a cost-basis balance sheet. The Madisons have 20 tons of prairie hay valued at $105 per ton and 20 tons of alfalfa hay valued at $195 per ton for a total value of $6,000. Purchased Feed, line 7, is entered at cost or market value, the purchase price multiplied by the quantity in inventory. Cost is usually easy to determine from receipts or farm records and usually will not be significantly different from current market value. A problem might arise when raised feed and purchased feed are commingled. The FFSC recommends that all feed in inventory, up to the total amount purchased during the last year, be treated as purchased and valued at average cost. Any remaining amount is considered raised feed. Supplies, line 8, are entered at cost, which is assumed to also represent market value. Supplies include stores of fuel, lubricants, veterinary medicines, baling wire, welding rods, and other similar items used in farm production. The Madisons included $2,000 worth of fence posts, diesel fuel, oil, and grease. Savings, line 11, is the total balance of the savings account(s), including interest earned. When the owner’s intent is to restrict the use of savings to the farm only, the amount may be entered on line 9, Other Current Assets. Although it provides liquidity for the farm business, James and Dolly consider their $28,394 savings to be primarily for personal use; hence, it is entered on line 11. Marketable Securities, line 12, are business assets that are held to provide liquidity and income in the short term. Common examples are stocks and bonds. When preparing consolidated statements, the value of these assets would be listed as nonfarm assets on line 13 if the intended use was strictly personal. Noncurrent assets are not normally for sale but rather are held for the production of livestock or crops to be sold later. Noncurrent assets are usually not easily and quickly converted to cash without some expense or loss in value. Some noncurrent assets are depreciable; others are not. Breeding livestock, machinery, equipment, and buildings are used up in the production process over more than one production cycle. These are depreciable assets. Information on depreciable assets may be found in OSU Extension Fact Sheet AGEC-791. Land is a non-depreciable asset and is typically the least liquid of the assets. Most noncurrent assets are entered at current market value when preparing a market-based balance sheet. Book value (cost less accumulated depreciation) is entered on a cost-based balance sheet and is also needed to calculate valuation equity. Tax basis for assets is needed to calculate deferred taxes. Vehicles, line 16, are entered at current market value when preparing a market-based balance sheet. Market value may be estimated by comparing the vehicles to similar assets sold at recent auctions, by hiring the services of a professional appraiser, or by relying on personal judgement. The Madisons estimate the market value of all their farm vehicles to be $86,000 at the balance sheet date. Machinery, Equipment, line 17, are valued in the same manner as vehicles. The Madison example shows the total market value for all machinery of $329,500 at the balance sheet date and an estimated market value of $367,957 one year later. Investments in Capital Leases, line 18, are entered at book value. A capital lease is a transaction that is termed a lease, but which has many of the qualities of a purchase. However, unlike normal purchases, ownership of the asset does not transfer at the transaction date, but may transfer at the end of the lease term. Lease payments, which are usually made in advance, give the lessee a right to use up some of the value of the asset over a specified period. At the end of that period, title may pass to the lessee or the major part of the value of the asset will have been used up. Current market value would, in many cases, overstate the lessee’s claim to the asset. Cost is determined by discounting the lease payments to present value at the date of the lease. This cost is then adjusted by accumulated depreciation to book value, which is entered on the balance sheet. A more complete discussion of capital leases is given in OSU Extension Facts AGEC-935. Contracts and Notes Receivable, line 19, are obligations of others which the owner is entitled to receive. For example, the owner may have sold a parcel of land to another individual and received a note promising payment(s) at specified time(s). The note would probably be secured by a mortgage. Only the principal balance of the note and interest accrued to the date of the balance sheet should be entered. Interest, which may be received at a later date, has not yet been earned and cannot be considered an asset. Some notes receivable have little or no security. These are included when it is likely that the payments will be received, but excluded if it is doubtful that the note will be collected. Investments in Cooperatives, line 20, are recorded at net equity. The most practical method for determining net equity in marketing and supply cooperatives would be to divide the shareholders’ equity by the number of outstanding shares and multiply by the number of shares held by the producer. Shareholders’ equity and number of shares outstanding should be readily available from the annual report of the cooperative(s). The value of stock held in farm credit cooperatives should be readily available from statements issued by the cooperatives. Stock in cooperatives is generally restricted in transferability and therefore has no easily determinable market value. The Madisons’ investment in cooperatives includes $18,000 net equity in the local farmer’s coop. Real Estate, Land, line 21, is valued at current market price when preparing a market-based balance sheet. Market value is determined by comparing the land to recent sales of similar land, by appraisal, or by the judgement of the owner. The Madisons own 960 acres with values ranging from $1,440 to $1,880 per acre for a total of $1,593,600. Buildings and Improvements, line 22, are also real property, but differ from land in that they are generally depreciable assets. In a market-based balance sheet, the current market value of all buildings and improvements is recorded. The Madison example includes three farm buildings valued at $47,000 at the balance sheet date. Cash Value of Life Insurance, line 25, is valued at the current market value, that is, the amount which might be borrowed against the policy or the cash amount which would be received if the policy were surrendered to the insurance company. Although this is usually a very liquid asset, it is considered noncurrent because the intent is to provide longer-term financial security rather than ready cash. Investment in Other Entities, line 26, should be accounted for in accordance with GAAP. If the owner’s holding is too small to have significant influence on the operation of the other entity, the asset should be entered on the balance sheet at cost. Dividends or distributions will be recorded as investment income and the cash or savings account, line 1 or line 11, will be adjusted accordingly. When the owner’s share of the entity is great enough to exert significant influence (generally assumed at 20% to 50% ownership), the net equity method should be used. In this situation, a portion of the earnings or losses of the other entity accrue to the shareholder and adjust the investment account, line 26. Dividends or distributions reduce the investment account and adjust the cash account. For example, assume that four partners each own a 25% interest in a business with equity of $400,000. Each would record an investment asset of $100,000 on their respective balance sheets. If the entity earned $40,000 during the year and kept the entire amount in retained earnings, each would record an investment in other entities of $110,000 at the end of the year. However, if the entity earned $40,000 and distributed $20,000 to the owners, each would record $105,000 investment in other entities and adjust their cash account by $5,000. When more than 50% of the other entity is owned, consolidated statements are required. Other Nonfarm Assets, line 27, should include the market value of items such as the residence or rental properties, which are not used in farm production and not easily converted to cash. The Madison’s house is valued at $65,000 on the balance sheet data. Current liabilities are those that are due in the current operating period, usually within 12 months. Accounts Payable are entered on line 30. These are obligations that arise from purchasing goods and services on credit. Whether through billing or credit card purchase, only the farm portion of credit card balances should be included on this line. Line of Credit and Operating Notes, line 31, include the principal balances of line-of-credit and other short-term loans. A “line-of-credit” is a financial arrangement where an operator may borrow as required to sustain operations up to a limit set with the lender. Short-term notes have a duration of one year or less and are typically single-payment notes but may have other repayment schedules. On the balance sheet date, the Madisons have a line-of-credit balance of $68,552 and a cattle note for $85,000. The sum of these notes, $153,552, is entered on line 31. The Current Portion of Term Debt, line 32, is the sum of principal payments, which will be due in the 12-month period following the balance sheet date on loans scheduled to be repaid over a period longer than one year. The portion of the principal amount, which is due within one year is a current liability and the remaining principal amount is classified as noncurrent. The Madisons have a tractor loan, a pickup loan, two loans for land, and a loan for their house. Their liabilities schedule lists $22,360 in currrent principal for the farm loans plus $8,104 for non-farm loans. Accrued Interest is calculated on all farm loans to the balance sheet date and entered on line 33. The easiest and most accurate means of determining the interest accrued is by obtaining a statement from the lender. If the loan statement is not available, an approximate amount may be calculated. For example, the Madisons’ tractor note has a principal balance of $22,067 and an interest rate of 10.5%. The last payment was made in mid-October 2014. Assuming that all payments are made in the middle of the month, interest will have accrued for 4 1/2 months to March 1, 2010: $22,067 x .105 = $2,317 for one year. $2,317 ÷ 12 = $193 per month and $193 x 4.5 = $869 accrued to the balance sheet date. Interest accrued to the operating notes and other term notes is calculated in the same manner. The total interest accrued to the Madisons’ notes is $10,623. Ad Valorem Taxes (taxes on assets based on value), line 34, and Employee Payroll Withholding, line 35, are amounts accrued to the balance sheet date. The Madisons owe half of the ad valorem (property) taxes for last year, due in March, plus an amount accrued for January of the current year for a total of $1,647. Income Taxes, line 36, are estimated amounts. The income tax liability accrues as taxable income is earned. Farmers generally have the option to pay estimated taxes quarterly or to file early in the next tax year. The graduated tax-rate system along with various exemptions and deductions make precise estimations of tax liability difficult until all supporting data can be assembled. James and Dolly Madison estimate their accrued tax liability to be $10,350 based on tax amounts paid in recent years and production for the past year. Deferred Taxes, line 37, arise when asset values increase beyond their tax basis. The change represents taxable income which is not recognized for tax purposes until the assets are actually sold. Most current assets will not have a tax basis since the cost of the assets are expensed. Two exceptions are marketable securities and livestock purchased for resale. Accrued expenses are subtracted from the excess of market value over tax basis to determine deferred taxable income for the current assets. This amount is then multiplied by an estimated average tax rate for federal and state income taxes. The Madison’s deferred taxable income is $107,201 on current assets. The Madisons estimate the average federal income rate to be about 20 percent and the state income tax rate will be about 5 percent. In addition, the first $106,800 of earned income is taxable as self-employment income at 12.4 percent. All earned income is taxed at 2.9 percent for medicare. Thus, the Madisons estimated current deferred taxes are $43,152. More detailed information about deferred taxes may be found in OSU Extension Fact Sheet AGEC-939. The total Deferred Tax expense for current assets is entered in the balance sheet on line 37. The sum of the current farm liabilities is entered on line 40. Non-Farm Current Liabilities are entered on lines 41 and 42. Personal credit card balances should be included with the current portion of other nonfarm liabilities on line 42. The Madisons have two nonfarm notes with current principal and accrued interest of $8,275. This is added to the farm liabilities and the result is entered in line 43, total current liabilities. Noncurrent Liabilities are those which are not due in the current operating year, but are due beyond this year. The Noncurrent Portion of Term Debt, line 44, is found by subtracting the principal balance due in the current year from the total principal owed. The tractor note in the Madison farm example has a principal balance of $22,067. This year $8,156 in principal payments is due and is included in the amount on line 32. The noncurrent principal balance is therefore $13,912. This amount is added to the noncurrent portion of the pickup note ($3,406) and entered on line 44, Notes Payable non-Real Estate. The non-current portion of the Federal Land Bank note ($77,370), and Equitable real estate loan ($42,000) is summed and entered on line 45, Notes Payable Real Estate. Noncurrent Deferred Taxes are calculated in the same manner as current deferred taxes. The procedure is slightly simpler since social security and medicare taxes do not apply to the noncurrent deferred income. The Madisons have taxable gains on non-current assets of $1,109,108, which is subject to federal and state income taxes. This deferred tax is estimated to be 25 percent of that amount, or $277,277. Credit for previous operating losses, which have not been claimed for tax purposes, should be calculated and subtracted from the estimated deferred taxes to determine the net noncurrent deferred tax liability. This amount is then transferred to the balance sheet on line 46. The total for noncurrent farm liabilities is entered in line 48. Any noncurrent portion of nonfarm liabilities such as the Madison’s house note are entered on lines 49 and 50, are added to the noncurrent farm liabilities and the total entered in line 51. Finally, total current liabilities, line 43, is added to total noncurrent liabilities, line 51, and the result entered in line 52, total liabilities. For marketable securities, tax basis (which equals cost in this case) will be used to determine deferred taxes and valuation equity. If a cost-basis balance sheet is prepared, enter the total cost of the securities. For full disclosure statements, book value for purchased breeding livestock is determined by subtracting accumulated depreciation from cost. Determining book value for raised breeding livestock is more complicated. This OSU fact sheet uses a base-value method, which roughly approximates the cost of raising an animal to production. The costs are expensed during each year as they occur and the base value is not depreciated. The base-value method greatly reduces record-keeping and is easier to use than the preferred method of full-cost absorption. With full-cost absorption, the total cost of raising an animal (or group of animals) to production age is accumulated and capitalized. The cost is then depreciated over the useful life of the animal. The Madisons use a schedule to estimate market value for the balance sheet and to record base values for raised breeding stock (OSU Extension Fact Sheet AGEC-791 ). For machinery and equipment, accumulated depreciation is subtracted from cost to determine book value. For land, original cost is used on a cost-basis balance sheet since land is never depreciated. Valuation of buildings and improvements for full-disclosure statements is the same as for machinery and equipment except that the useful life used in calculating depreciation is usually longer. Owner equity is a calculated residual after the claims of others (liabilities) are subtracted from the value of assets. Total equity is, therefore, easy to determine once the value for total assets and total liabilities have been calculated. Division of total equity into contributed capital, retained earnings, and valuation equity is very useful in analyzing the farm’s productivity and financial position. Contributed Capital (line 53) represents the original investment into the business (or reporting entity) plus additional amounts that may have been added by some source from outside the entity such as gifts and inheritances. When the farm business alone is the reporting entity, additional investment of the owner’s personal funds (e.g., wages from off-farm work) would be added to the initial investment and withdrawals from the business (e.g. family living expenses) would be subtracted. In the example, the Madisons include personal and other nonfarm assets and liabilities in the financial statements. Thus, the reporting entity is the combination of the owners and the business. Any movement of personal assets to or from the farm does not change the contributed capital of the combined entity. Their contributed capital of $93,500 is the original cash amount (not borrowed), which they paid for their first farm and some used equipment. Retained Earnings (line 54) are an accumulation of net earnings, which have not been withdrawn or distributed. A series of retained earnings provides strong historical evidence of the ability of the business to generate profits above withdrawals. The amount may be difficult to determine directly if adequate records are not available to show net farm income for each year since the beginning of the business. However, the amount may be determined indirectly by subtracting contributed capital and valuation equity from total equity. The Madisons’ retained earnings of $1,270,961 is about 64 percent of their total equity of $1,990,000 and the projected increase in retained earnings, $16,599, for the year indicates a profitable operation. Total Valuation Equity (line 55) is the change in owner equity due to changes in the market values of assets owned. Valuation equity equals the sum of market values of assets minus the sum of book values (cost less accumulated depreciation) and minus noncurrent deferred taxes. The Madisons total valuation equity as o f the balance sheet data is $625,540. 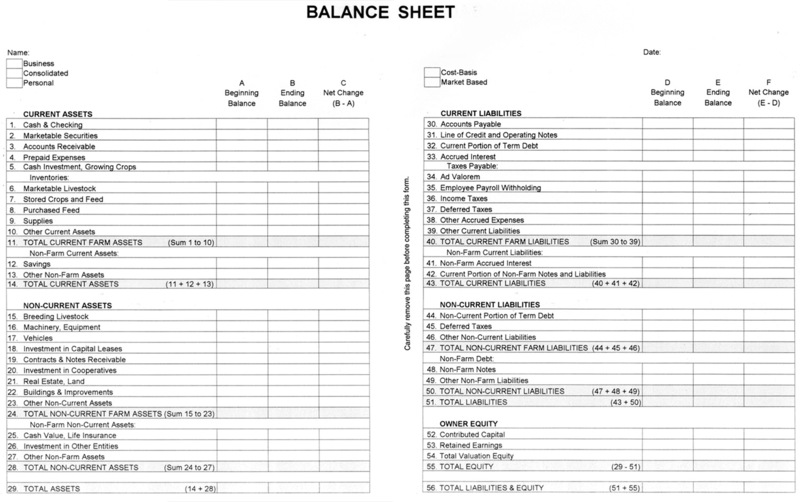 The balance sheet is one of the most commonly used financial tools. Time invested in keeping records and preparing financial statements including the balance sheet yield positive returns. However, the balance sheet does not measure profitability except to the extent that profits increase retained earnings and total owner equity from one period to the next. It also does not measure the repayment capacity or the ability to meet financial obligations when they come due. Thus, for financial analysis and credit management purposes, the balance sheet should be supplemented with an income statement and a cash flow projection.